Miriam Lafayette really knows what she’s doing. She absolutely has it together. Who’s Miriam Lafayette? I made her up while washing dishes, but let’s have her represent a person whose work you love. You look forward to her new content every time she publishes. You’d be so excited if you could have brunch with her in a fancy cafe. She’d radiate luminous energy as you both sipped tiny cups of espresso and nibbled on delectable cuisine. But if you did meet Miriam, you’d discover that she’s not always pleased with her creations. Her run-of-the-mill aura is nothing to write home about, and she regards a lot of her content as boring and cliché. Don’t get her started on her mispronunciation of “Lactobacillus acidophilus” in her latest YouTube video — it was so embarrassing. Miriam’s power simply stems from her unrelenting motivation to help her audience. This is great news for you, because you can adopt Miriam’s work ethic to develop your authority and build your own audience. You just need to commit to a content production process that works for you. And if you’re still skeptical that well-known authorities criticize themselves, check out this video of Adele — yes, the master vocalist, Adele — disparaging her voice. On the surface, content is a vehicle for attracting prospects and leads who will eventually become customers or clients. “We want to pull the right people in. And if we’re smart, we want to chase the wrong people away. Discover how you can use content to open these unexpected doors in Sonia’s article, The Law of (Content) Attraction. Debbie Hodge’s membership site was loaded with tons of value — ebooks, worksheets, audio, video, etc. It was a result of hard work, focus, and dedication. So, what could possibly be problematic? Her members were intimidated by all the content. They either didn’t know where to start or couldn’t find time to study all of her materials. Debbie knew she had to transform her content library into an accessible resource that members would love and use regularly. In 4 Ways to Turn a Mature Membership Site into a Treasured Resource Your Members Will Love, she explains the important changes she made. The best part is Debbie’s organizational tips are also helpful if you’re still in the early stages of building a membership site or you plan to build one in the future. Once you establish a workflow, you’ll notice ways you can be more efficient. He reveals a simple way to set up content marketing workflows in How to Tame Content Creation Chaos with Rock-Solid Workflows. Don’t let any self-doubt you may have hold you back from sharing your unique skills and areas of expertise. The benefits of helping others outweigh the drawbacks of embarrassing mistakes you may make along the way. When your content attracts the right people, those individuals will stick around on your good days and bad days because they realize you’re human — just like them. 2. 4 Ways to Turn a Mature Membership Site into a Treasured Resource Your Members Will Love. 3. How to Tame Content Creation Chaos with Rock-Solid Workflows. and Seriously These Topics are Incredibly Great. Love it how you conclude this article “….When your content attracts the right people, those individuals will stick around on your good days and bad days…” Because it’s not about the quantity of the people. When you start something you will always have a common point: the first step, the first reader, the first customer. The first! Take care of the first and then the first will take care of you! Some of those childhood lessons die hard. And some we just learn to cope with and are happy to reminded of the truth so they don’t stop us from taking action. Gotta love Miriam, even up close and personal. Yes! 🙂 She’s a reminder that we can all take action — just like you said, Leslie! I have been facing problem of creating content like how and what kind of content should i publish on my blog. once i publish what readers were looking for but later when i checked analytic i was disappointed.Today I came here from Alltop and found that there are lot of thing which i need to learn for getting readers and traffic. Incredibly superb topic you have came over with. It always great to help others, this hides up our mistakes in the way. they would too look out for us, in our good or bad times. I got to learn here a lot of things, which would help my site to receive large numbers of customers. The key takeaway for me is to have an easy to use resources for the members. It is the base to make the members stick for longer and evidently have them take some value out of it. Great article i must say. Thanks for sharing this. Thanks for this informative stuff . Great article. 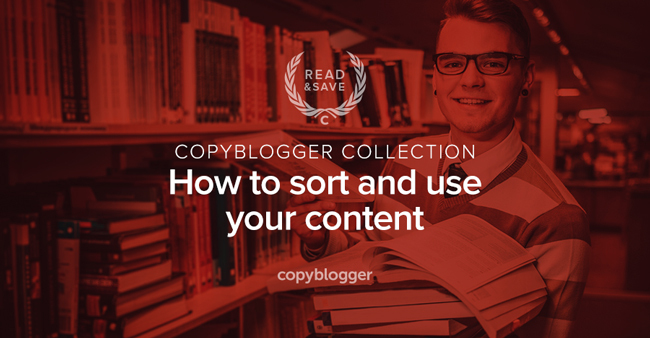 Organizing and sorting content is the most important aspect of content marketing or even personal blogging. I am a brand new reader to your blog. Writing a catchy heading for the blogs I create has always been my lowest strength – hopefully following your website regularly will improve it!